Brands I love | People worth shouting about. I recently discovered the delightful online shop – House of Henry. They sell a range of gifts especially for the most discerning of dog lovers. Many products can be personalised and everything is designed and printed in-house. After a few excitable chats together, we have teamed up. So...at your request, I can arrange for them to print my bespoke portraits onto fabric! The printed fabric will be mounted inside two 8mm-thick acrylic sheets and held together by tiny but strong magnets in the corners. The frame stands up independently, so absolutely no hanging fixings are required. You'll also be able to choose from six different fabric colours. 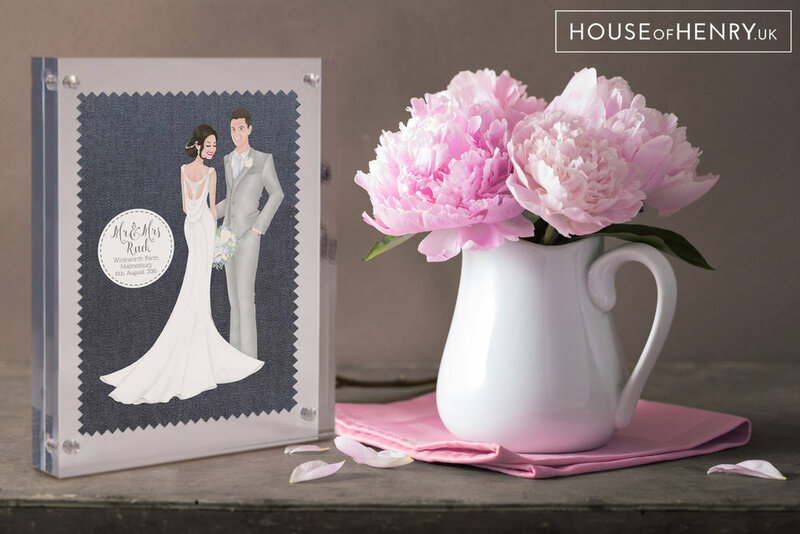 House of Henry's framed fabric prints are available in two sizes (5"x7" and 5"x5"), and when you choose this as your printing option, you will receive a £5.00 voucher to spend at House of Henry on anything you like! If you'd like your illustration printing by House of Henry onto fabric, simply let me know when you make your enquiry or fill in my get a quote form.